Transportations Needed ASAP | Dogs Needing Homes | About Me | My Pets | Favorite Links | Contact Me | View & Sign My Guestbook | Foster Application | Adoption Application | Home Checks Needed | Need a WebPage Made FOR you? 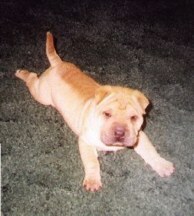 Welcome to the Misty's Chinese Shar Pei Rescue and Adoption Help Page web site. This page has been designed by a shar pei lover who wishes for great homes for all shar pei, no matter what the circumtances. I love Chinee Shar Pei, and am willing to help anyone I can. Post Shar Pei (or any other dog really)who you know needs help. Do you know of a shar pei who needs adopted? Rescued? In a shelter? Going to be put to sleep? Post it here, and we will do our best to find a new and forever home for him/her. Looking to adopt a pei? Check our posts, pictures, and "Available" page continually. I sincerely hope this helps! YES, I WANT TO HELP IN EVERY WAY THAT I CAN!